Saturday, December 11, 2004 -- Weather is warming up quite a bit. In the 60s and 70s the past several days. Took the van to the shop this morning. Transmission won't shift out of first gear. Found out the only problem is a bad filter, and needs new oil. Dara and daddy went swimming again today. Benjamin was too sick, so he just rested. We went to the Christmas celebration at Big Valley Grace tonight. Dara has been writing a report for the newspaper at his school on our relationship to President Abraham Lincoln, our third cousin. Benjamin has been drawing lots of dinosaurs lately. 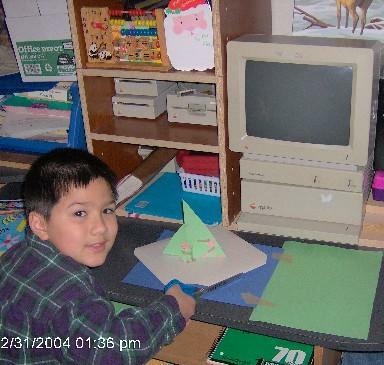 Sunday, December 26, 2004 -- Christmas has come and gone. We did not see any snow. Dara and Benjamin are having fun with their new Legos (Bionicles). Benjamin really likes his new dominoes too. Ben and Dara have played their new Scrabble game. 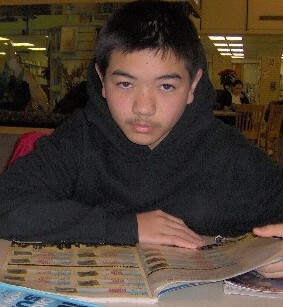 Daddy (that's me) is still learning how to use his new digital camera. I've taken some pictures, and figured out how to upload the images to the computer. Dara has figured out most of the functions on our digital camera all by himself, without even using the instruction manual (which I'm still reading!). Friday, December 30, 2004 -- Last night it rained very hard. Today the sun is trying to shine through the clouds, but it doesn't look like we'll see the sun today. Benjamin has been having fun creating more artwork. You can see his picture at the bottom of this page. We are waiting for the pizzas. They sure smell good! Left: Benjamin is having fun cutting and pasting. 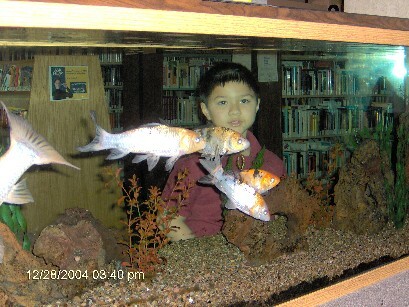 Right: Benjamin at the Modesto Library. Left: Benny is relaxing at the library, while reading. 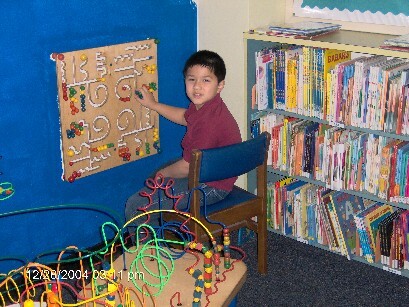 Right: Benny is playing with the games in the Children's section. 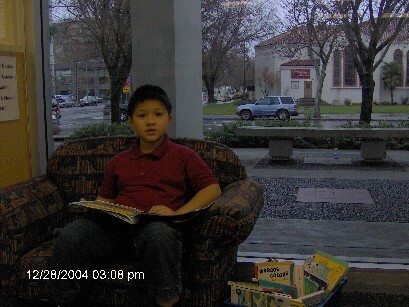 Left: Dara is reading at the library. 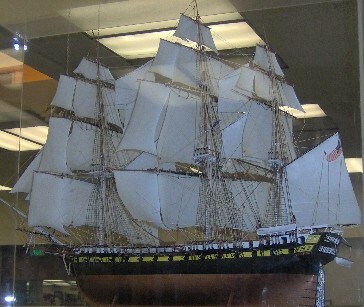 Right: Model ship at the library. 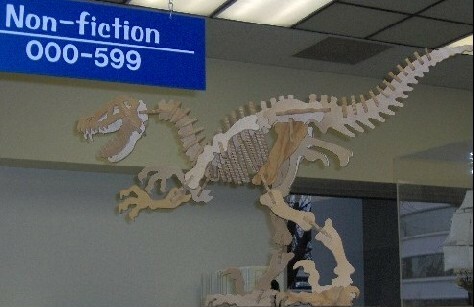 Left: Model dinosaur at the library. 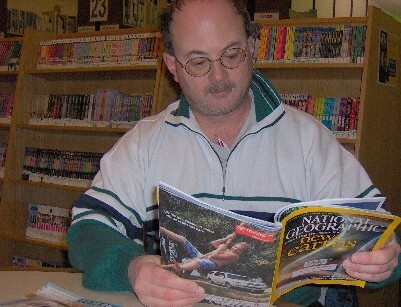 Right: Vern reading National Geographic at the library. 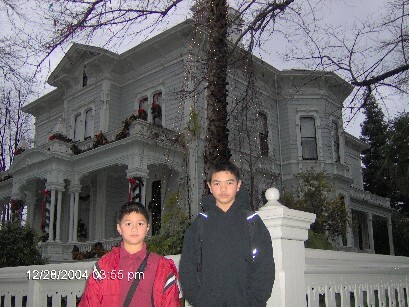 Left: Ben and Dara in front of the McHenry Mansion. 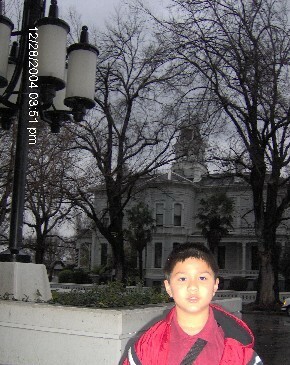 Right: Benny in front of the library, with the McHenry Mansion in the background. 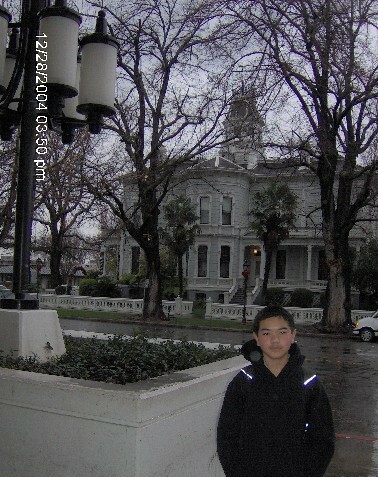 Dara in front of the library, McHenry Mansion in background.